Pops has a habanero plant at the farm that is going crazy. Every time he goes there to harvest the garden, he comes home with dozens of habaneros. He isn't quite sure what to do with them though. He has stuffed some along with he weekly stuffed jalapenos. They were good, but you can't eat more than one like that. (You can, but you might not like yourself much afterwards!) He is thinking of putting some in his dehydrated hot pepper mix. That should add some kick! Otherwise he is just trying to give them away. I have been wanting him to make some into peach habanero jelly, but he hasn't followed through. So, I took matters into my own hands! I don't mess around when it comes to hot peppers, so I donned the gloves and went to work. There is nothing worse than taking your contacts out and finding out you still have hot pepper juice on your fingers! This recipe is really simple. Using and immersion blender made it even easier. No pectin or gelatin needed either. This will thicken up plenty on it's own. I did some searching for recipes and found that some added all sorts of spices and flavors. I just wanted it to be the sweet of the peach and the heat of the pepper. So, this recipe is simple and delicious. I kept the seeds in my peppers, so there is plenty of kick. It will be perfect served over some cream cheese or goat cheese. I have big plans to use one jar for my brother K.C. 's birthday. Just wait until you see what we are doing! I used this cast iron saucier to make the jelly. I don't know why I have never done that before! The cast iron was perfect for keeping things from scorching and the lack of corners meant nothing got missed when I was stirring. It is perfect for a batch of jelly this size and will be used this way in the future for sure!!! One last little tip. I know the picture above is a strange one to post... but it is worth it! MiMi and I have had some trouble with jellies and jams in the past. We follow the instructions exactly and end up with looser jams than we had hoped for. (Don't worry, loose jam is perfect over pancakes, waffles and ice cream!) This time though, I put a small drop on a plate and stuck it in the fridge. In no time at all it cooled and proved my jelly was ready to come off the heat and go into jars. No guess work needed and no surprises later! Place all ingredients in a heavy bottomed sauce pan and allow to sit for an hour. I used an immersion blender to break down the peaches later in the process. If you don't have one, finely chop your peaches before you add them to the pot. Turn heat to medium low and bring to a slow boil. Stir occasionally to ensure nothing is sticking. The mixture will be really foamy. Keep at a low boil, stirring frequently for 15 minutes. Use an immersion blender to make the mixture as smooth as you would like. 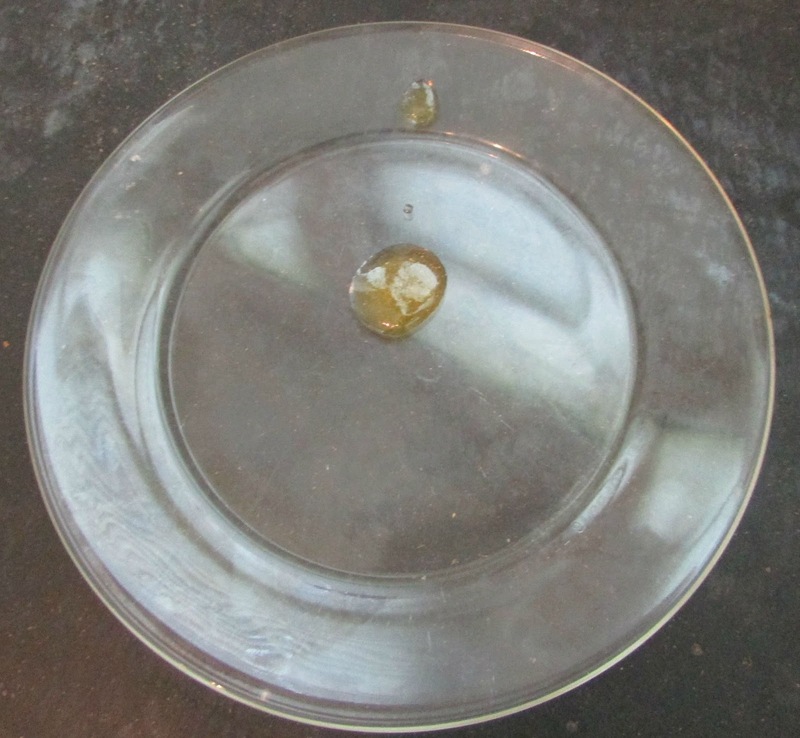 Check the consistency of your jelly by dropping a small drop on a plate and sticking it in the fridge for a minute. If it is still runny, continue to boil until you get your desired consistency. Ladle into clean jars and keep in the refrigerator for up to a month or the freezer for 6 months. Did you ever wonder why there is almost always lemon in jelly and jam recipes? Here's why! I do agree, this would be great with cream cheese and crackers, the recipe seems so simple. Thanks, and I think the layout of you site is fantastic. I can't wait to use some tomorrow! Thanks so much for stopping by! I bet the peach and habanaro flavors would be tasty together, Carlee. I will have to remember your jelly testing tip. One of these days, I want to start venturing into canning. They really do go well together. Next time I think I need to take a few seeds out though, this version is a little hot for some. I think it is tasty just the way it is though! They are a really hot pepper. It used to be considered the hottest of the hot peppers, but now there are even hotter ones! It is a close relative to the Scotch Bonnet pepper they use in the Caribbean. They definitely added some punch to this jelly! Oh my I need to make this for my husband! He just loves peaches and habaneros and eats jelly on his bagel everyday. He used to eat a scotch bonnet pepper jelly but we can't find it anymore and I keep telling him we can make it. And now you have this recipe! Yay! It is a lot easier than you would think! We really loved the results, I hope he does too. This looks yummy Carlee!! 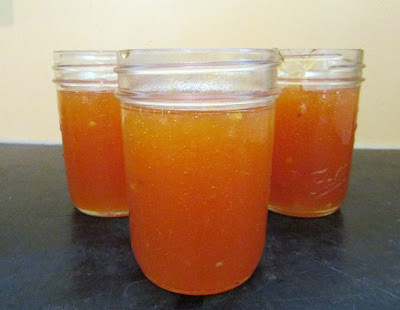 I made jalapeno jelly this summer...love the addition of the peaches with the spicy!! Thanks for sharing on My 2 Favorite Things on Thursday! Hope to see you again this week! Pinned! I love jalapeno jelly, but have never made it myself. I really should do that, our plants are going crazy! Thanks for hosting! They certainly aren't for the faint of heart, but if you get past the heat I think they have some fruity tones so it is perfect with the peach. You could certainly tone it down a bit if you didn't want it so hot, but my family likes to impress each other with how much heat they can stand. So I had to kick this up a level or two! Yum Yum Yum! I love jalapeno jelly with cream cheese and crackers so I'm sure this would be delicious as well! Writing this one down right now to serve at this weekend's family get-together. Thanks for sharing at Inspiration Thursday! It was really good and so much easier than I thought! We are having a fantasy football draft this weekend so I am looking forward to breaking out another jar! I LOVE jelly with a little kick...or even a big kick. Thanks for posting this. I made a peach pepper preserves earlier this season, but this looks like one that I should certainly try. We have really been enjoying this, and it was so easy! We stuffed some a couple of weeks ago, and we each only had one or two! They definitely were a bit more intense that the jalapenos we normally do. They really do go well with the peaches and the sweet is so good with the heat. We stuffed wontons with cream cheese and this jelly last week and it was so good! 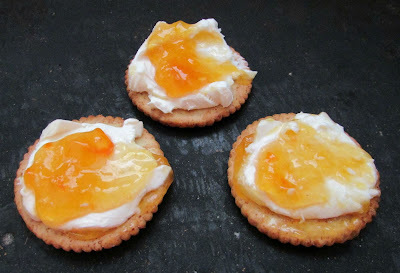 I just had a snack of cream cheese and this jelly over crackers, also very good! Oh man, I love jalapeño jelly but this looks so good! I've haven't grown habanero peppers before, are they like other hot peppers? I have 4 jalapeño plants in mu garden right now :) And I just froze 3 big bags of peaches from my friend tree so I have the peaches already! Habaneros grow about the same as the jalapenos. My sister and dad each have one plant and they are producing more than we can keep up with. We only did jalapenos this year and we just dropped off a grocery bag FULL at a friend's. We must be having good hot pepper growing conditions this summer! Ps. I am jealous of your peaches from your friend's tree! It is definitely spicy. At first taste you get mostly the sweet and peach, but it leaves you with a burn. The cream cheese does help tame it. I don't think I would spread it right on toast for breakfast like strawberry jam! I've been addicted to it! I almost single handedly drained a jar this week! Thanks for hosting. How many jars does this make? Sounds delicious! It makes 3 of the jelly jar sized jars. It really is delicious with cream cheese and crackers and we've made some really good chicken wings with it too!